When you have touched the edge of Eternity and faced a second of your own future Judgement you are never quite the same again. This is why those that claim to be mystics and have messages from Jesus or Mary but then try to get WEALTH from these claims of mystical knowledge are LIARS. When you have touched the edge of heaven, you never fully want the things of the earth again, because everything that sparkles is so dull compared to the beauty of Heaven. I have sure knowledge of God's existence and He has confirmed every promise made to those who love and also fear Him. I cannot prove His existence, because that is not how He works. Do not ask God to provide you proof of His existence, ask Him to provide proof of His love, and then watch what happens in your life. In the beginning God created with His word, and it was good. Satan created with his word, and it was evil. Adam and Eve listened to the devil and by their free will chose death and sin to come into the world. 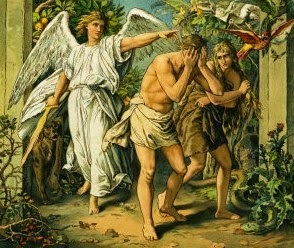 Man, through Adam had EXCHANGED intimate relationship with God for a stain of sin and death that would be generational. Because of the unfaithfulness of His people, God allowed His people to go through many tribulations and suffering in order to bring them to a state of purification. He did this by the creation of life through a holy act of sexual creation. (The "begat"s in the bible). With each "begat", This purification of the hearts of the Jewish people in one lineage (David) led to a heart so pure that the heart of the woman that had the potential to be a holy vessel for God himself to come into her womb. At God's intervention, at Mary's conception, God made the chosen vessel of the Christ, the Blessed Virgin Mary, to be Immaculate, or free of the original sin of Adam in her Mother's womb. At the exact moment that Mary was perfected to be God's vessel of our Salvation, God rained His blessings on the Earth by sending an angel to say to her, "Hail Favored One! ", and with her yes, the story of our Salvation begins. She was always the first to say yes to Jesus. She was presented with an EXCHANGE of her own, for this unplanned pregnancy could potentially cost her suffering and even her life. God in His goodness sent her a protector in the form of Joseph her husband. At the conception of Jesus in the womb of the Holy Virgin Mary (for God cannot come into any place that is not holy) the EXCHANGE began. God EXCHANGED heaven for flesh, and at His death on a Cross, God would leave a permanent sign of the way to heaven through the EXCHANGE. The sign of this exchange is NOT an empty cross, but one with our Lord on it in His suffering. When Moses held up the snake on a wooden staff, those that looked upon it were healed. Jesus even compared His passion to this event. "And as Moses lifted up the serpent in the wilderness, even so must the Son of Man be lifted up; that whoever believes may in Him have eternal life." [John 3:14-15]. Many deny Jesus on the Cross, and protest that He is no longer on the Cross. True, but if Jesus compared himself to the event in the Old Testament, and did not instruct us to remove the image of the snake on the pole that represented His passion, then we must study the Lord's passion with Jesus ON THE CROSS. 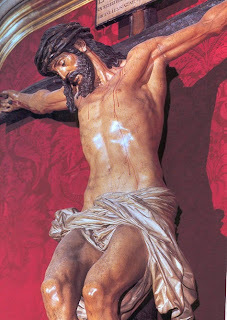 Not to re-crucify our Lord, but to study the ULTIMATE SIGN OF THE EXCHANGE, and find our way to our own final suffering and passion as He wills it. Only by studying the sign allowed by God which is Jesus ON the Cross can we fully walk the path that is laid before us and drink the cup of suffering that may be presented to us. The EXCHANGE is simple. A life for a life. God came and by His will laid down His life for us, submitting His flesh completely to the will of God, as God allowed His Passion to progress. He did this not because He had to, not because it was something He could do for His Father, but because the LOVE in His heart brought forth His willingness to lay down His life for all of us. Jesus didn't just begin pouring out His life for us at His Passion, He began pouring himself out at the beginning of His ministry. Feeding the poor, healing the sick, raising the dead, showing us not only holy poverty but God's providence in that holy poverty. In His poverty Jesus paid his bills in holy obedience. (The temple tax). As the shadow of the Cross passes over us, we know that we too must walk our own path to Calvary, not exactly as He did, but as we have been assigned and placed on this Earth and to the best of our abilities. Jesus did nothing for Himself, and we see Him teaching and giving all for others, pouring Himself out for others through all His Ministry. All of this was like the previews to what the final destination would be, but the message from all of it is the same. The road to heaven is to pour yourself out for another because of love for God and the one you pour yourself out for. In order to seek the salvation and the good of another because you love God so much you would not wish to feel the heart of God hurt by the loss of a soul to hell for all time. Knowing that you can do nothing for God, but as you love Him, you know that His heart will be moved by your love to work in the life and salvation of those you pray for. All of this must be done to seek NOTHING FOR SELF. We only pray for a few crumbs from the Master's table to fall to us at the judgement. This is giving a life for a life. This is what the Saints knew, and tried to teach us. Fasting, prayer, works of charity, and with the greatest love of God in the hearts of the Saints, even miracles. When we see the life of a person completely make a 180 degree turn, and every aspect of the person's life changes to reflect the life God wishes for us, we are witnessing a soul who has accepted the EXCHANGE. St. Augustine of Hippo is one of these. The Saints that embraced Holy Poverty, Obedience, and Chastity, giving all that they had for love alone to God and others, where those that also realized the terrifying aspect of the Cross. The terrifying aspect of the Cross is that before the moment of His Ascension into Heaven was 100% of God's mercy poured on the Earth in the form of the Blood of His Son. On the judgement side of the Cross will be the Judgement of God when He returns. Each of us will be presented with His Passion and Crucifixion in comparison to how we have lived our own Passion in our lives in our book of life. 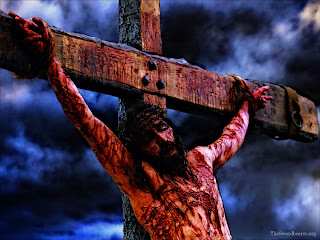 While we live, we are still on this side of the Cross, the side of His love and Mercy. We have time to repent and preach to other's the importance of studying the Passion of our Lord on the Cross so that those who would, will accept the gift of the EXCHANGE. Look at the world. How many are shirking the EXCHANGE in their lives, leading lives of complete "me, me, me..." selfishness. This self centeredness leads to so many sins; adultery, lying, stealing, murder, all sexual sins. How many are on the path of destruction because they wish their own will and not Gods. Jesus taught us this also. The Innocent must pay for the guilty. Holy hidden souls are needed that love God and are willing to do much Penance and offer sacrifices for the sake of the Salvation of those who are running headlong into eternal damnation. If we have someone we love who is not saved, or living an atheistic life, then if we say we love them, we can offer some small sacrifice and do penance for this soul. All of this must be completely hidden from the eyes of others, for if we seek acclaim for our holiness, we have cut off our communication with the ONE who can actually do something about the one we love who is lost. 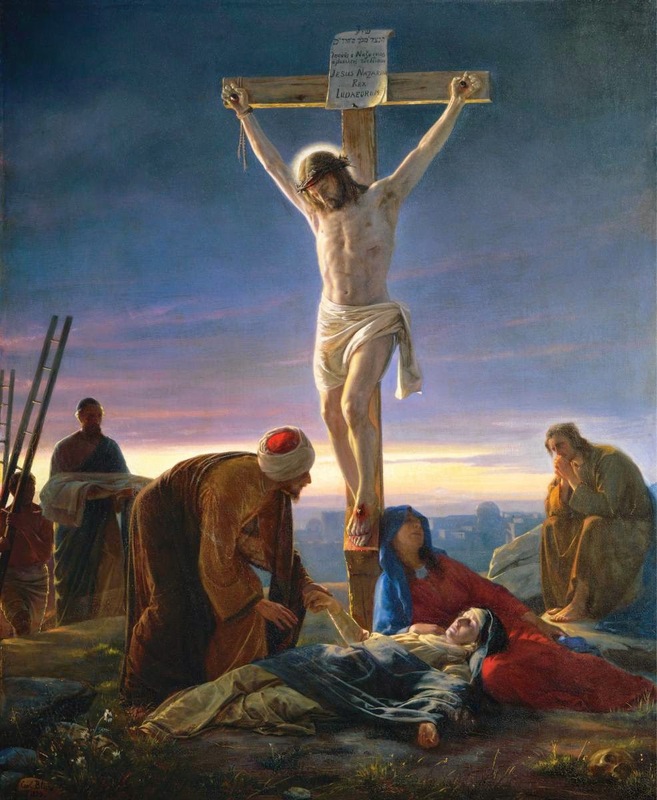 The time of seeking mercy by the Holy Passion and Crucifixion of our Lord is a limited proposition. There will come a time when our Lord will say..."That's it, time's up. " Do the sacrifice now, do penance now, for the one you seek to know God, and never give up on those that are lost, even to your last breath. *Inspired by the writing of Bryan Melvin.